The following are all the games that have been created by Christopher Wiley. Each concept is in various stages of development as listed under the title. The date of inception is also listed. 5 Minute Missions is a quick dice rolling and story telling game. Each player has a specific role and a unique set of dice to roll. Icons on the dice match those on the Mission Mat. The higher the number of matching symbols the more successful the mission. Each level of success on the Mission Mat leads to a different Mission Mat, which continues the story of the intrepid crew. The story can continue in a favorable, average, or unfavorable track depending on the success level of the previous Mission Mat. 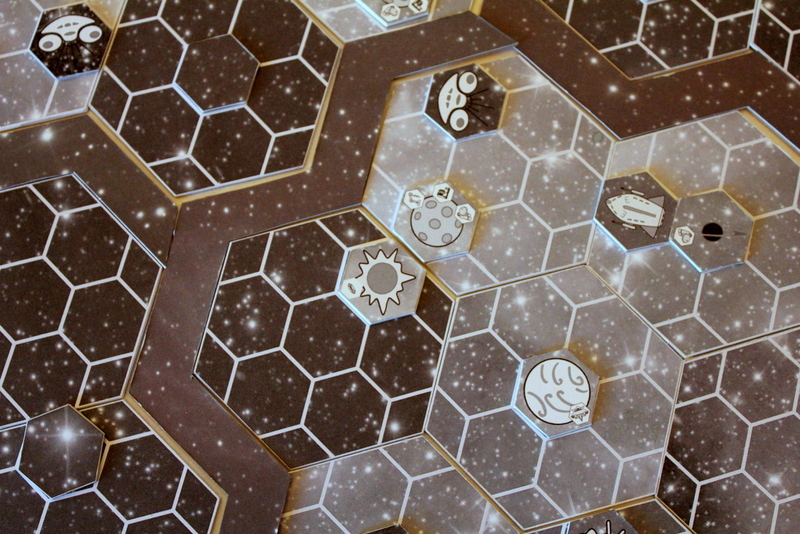 AirLock is a tile based board game set on the doomed research vessel Horizon. A hostile swarm of xenos threats have entered the ship, and you must get your Trooper and Civilian to safety before it collapses around them. Combat and evade larva, pupa, and adult invaders! Stomp their eggs that block your path! Avoid the mutagenic effects of spore clouds! Guide your pair through the ships cabins. There is safety in the airlocks, but don’t linger too long as the stress of the invasion wreaks havoc on the structural integrity of the ship. Access the E.M.S. bays to gather equipment and supplies. Interface with the Comm Links to get your orders toward the specific win conditions for your game. Fires and clouds of toxic gas can injure the crew. Execute Command Functions to gain advantages during your escape. Randomly generated ship layouts paired with cabin conditions and variable enemy counts provide a uniques ship and challenge every time. Three tiers of scoring opportunities makes for varied win conditions, and changing player goals. AirLock proves to be an exciting and immersive experience with every play. AirLock: The Card Game takes the ship running, xenos dodging action of Airlock and pares it down to a few decks of cards. All the xenos baddies, all the weapons, all the hazards you loved are here. In this cooperative card game each player takes on the role of a trooper and civilian pair on the doomed ship Horizon. Using a small deck of cards to generate action points players will combat the xenos threat, counteract stress to the ship, and navigate hazards in the cabins of the collapsing ship. Matching the points totaled on their cards to the threats they encounter gets them through the dangers they face. As they move through the ship the players will draw equipment and weapon cards to add to their inventory. Action points are multiplied, redirected, or used to power protective equipment when applied to these cards, giving players more of a chance of surviving the increasingly difficult cabins of the ship. Reach the escape pods before your health runs out, and you just might survive! In the 14th month of the solar year 2035, the merchant ship Antares encountered an unknown alien entity. Diverting from their heading home, and investigating an ancient alien archaeological site, the crew unknowingly brought the threat aboard their ship. Once it awoke, it was too late. Participate and observe the final hours of the crew’s stay on the Antares. Can any of the seven crew members survive. If the weapons hold out. If they can shut down the critical functions of the ship. If they can stock the escape craft with the essential resources for the trip home. Maybe they’ll have a chance. Don’t let their story go unfinished. Antares features a deck based initiative system, encounter deck, and a post encounter status deck for the crew. In ages past great tribes of Warriors would war over lands and resources. The survival of their people would depend upon the outcome of these conflicts. The battles could be intense and the warriors depended upon their King for inspiration and strength. He was their leader and if he fell in battle, the tribe fell with him. Face off against your opponent. Tribe against Tribe! Axes against Shields! Fight with valor and draw the Blood of a King! Blood of a king is a quick playing card battle game for two players. Matching Axes and Shields gives you offense and defense points. Out score your opponents defenses and wound the Tribe. If your lucky, the King himself! Beware the Witch, as she will take a warrior with her to the grave. Call upon the Berserks in a time of need. Deliver three wounds to the enemy King, and you will stand victorious! An epic battle rages! Swordsmen charge! Archers volley! The tale will be told in the skies above! Carrion Call is a two player, head to head, light deck building game. Using identical 10 card starting decks players take turns laying down cards to place crows and vultures into the sky above the enemy front, or to move birds out of the sky above theirs. The bird counters move in flight paths leading away from your side into your opponents, and back again. Attack cards can combo to place even more birds. At the end of each round players will add a powerful bonus card to their deck to manipulate even more of the avian counters. Play your attacks strong, counter with your defences, save your big move for the right moment. At the end of four rounds the player with the lowest points total is the winner. Two will fight, the birds take flight, will you answer the Carrion Call! From the pages of H.P. Lovecraft’s writings and the imagination of Christopher Wiley comes Dark Places. Answer the call of the secret society, the Corporis Custodiis, the body that watches. Dark deeds are afoot. The old cults are trying to wake the Great Old Ones yet again. Great darkness stirs, and strange creatures erupt from the shadows. Dark Places pits players against the clock in a race against time. Anonymous heroes who will risk life and sanity to locate and disrupt the foul plan. Arcane skill and physical prowess will be your strengths. Items both common and arcane may lend you help along the way. Ancient a loathsome relics can play their part, if you willing to pay the cost. Explore the sleeping hamlet of Easthaven, plumb the depths of Darkwater, walk the Eternal Sands among the great pyramids, or stand at the Roof of the Word on Mt. Everest. A unique clock mechanism tracks players turns, triggers Story elements, and determines Event areas. Multiple decks with map specific added cards make for great replay value. Scaled difficulty levels based on the number of players offers a challenge every game. Dark Places: The Card Game is an small deck building experience based on the lore of H.P. Lovecraft. Travel to locations around the globe as one of the Corporis Custodiis, the anonymous members of “ The Body that Watches”. Combat the minions of the Great Old Ones. use your deck of Physical and Arcane skill cards to generate skill points. Use those points to confront the enemies of humanity, and send them back to the shadows. Be victorious, or risk your nerves fraying. Defeating the enemy provide rewards in the form of additional skill cards to ad to your starting deck, but defeat can test the limits of your sanity by adding madness cards into your deck. Too many, and you compromise your ability to overcome the enemy. Close gates, collect enough Lore points to banish the Great Old One to the dreamlands, or have to face it in the final conflict. The call is out. Will you answer. ﻿DarkQuest is a dungeon adventure game for 1-5 players. The game relies on a dexterity based system for generating action points. Roll your set of 6 cubes on the points mat to determine your action point pool for the round. Use them to trigger weapons of items in your inventory. Arms cards, rather than character class, determine the weapon type and damage a player can use and inflict against the numerous enemies lurking in the dungeon. Failing to kill an enemy can result in losing health or getting a “corruption” cube. A black cube that replaces one of your starting cubes, and can reduce the number of points generated when you roll on the mat. During the game Loot cards provide additional weapons and useful items. Equipping a new weapon can alter your “class” and give you different attacks and abilities. Explore the rooms and defeat the enemies to acquire a relic, which is required to win the game. Exits out of the dungeon are Key specific or offer an alternate requirement to leave. Get out alive, with one or more relics, and your a Hero! Making it this far has not been easy. You enter the next chamber. The enemy is ready and waiting! Their cries of outrage echo off the rough walls as they advance. This challenge will not be easy, but you know you are not alone! Readying yourself for the attack, you draw your Gems!! Wait, Gems? Yes, Gems!! Dungeon2 (squared) offers an unusual take on the classic dungeon crawler. Battles are won and lost, treasure and magic items are collected, and gold is hoarded using a clever deck building and color mixing mechanism. It’s as easy as yellow + blue = green, but offers tense, simultaneous play for 1-4 players. Movement: Either North, South, East, or West. Defend: increase your individual defense value to avoid taking wounds. Fire Action: fire you selected weapon. Action: Interact with the environment. Draw a weapon from a supply area, or hunker down in one of the defensible structures on the map. The board randomly constructed from 25 of the 30 square landscape tiles, so the environment can be different for every play. A compass rose tile establishes the cardinal points for each round. Rangefinders determine if a Fire Action is successful. There are cards to track each players’ Health and Defense. Fairies, mushrooms, acorns, and trolls!! Fairy Dell is a tower defense style game for 1 - 6 players. You are the Fairies of the Dell, and it is the great solstice celebration! The queen is here with her court to feast and sing into the night. But wait!! There are some uninvited guests! The forest Trolls want to break up the party, and capture the Queen. The only hope?! Grow the protective Fairy Ring to secure the Queen from those rotten Goblins. Move about the Dell and play pairs of mushroom cards to place the protective mushrooms to keep the Goblins out. Beware, each card you play will cause more Goblins to enter the Dell and move those that already threaten the Queen. Hope is not lost! For you have Poison Ivy to block the Goblins’ path, and stout acorns to throw, and knock them from the Dell. The Queen can assist you in the fight with her seasonal powers. Freeze them where they stand, block them with the plants of the forest, blow them into confusion with an autumn gust, or burn them from the Dell with the summer sun. Fairy Dell provides a strong, family friendly theme, cooperative play, and just enough of a challenge for adults and younger players alike. Ja’Ca’Witz is the mayan word for mountain or temple. Enter the temple on your archeological trek to discover which ruler lies buried beneath this sacred place. Roll your dice! Fire, water, and sky are the keys to unlock the mysteries. Help your fellow explorers to beat group challenges, leave them to their own devices when there is treasure, artifacts, or knowledge to be gained. Beware, Q’uq’umatz will have his offerings as well, or time will run out. Collect the glyphs of the Totem Challenges to decipher the name of the long buried ruler. Be sure to have collected enough treasure, artifacts, and knowledge in case another claims to know the name as well. It’s Christmas Eve and St. Nick is about, leaving gifts for all the good boys and girls, but he’s not alone. The Krampus is making his rounds as well, punishing those who were not so good this year. Gather the good little children, but watch out, the Krampus knows who’s been Naughty this year. Krampus is a holiday take on the classic game of Old Maid. Deal out all the cards, Pick from the player to your right, and try to match the images on your cards to score pairs. If you happen to draw the Krampus card, one of your pairs on nice little children have been naughty. Off to the discard pile! Unless you already have St. Nick, then there is no penalty. If you hold the Krampus card after all the pairs have been made you lose, and the player with the most pairs wins! If you end the game with both Krampus and St. Nick then you’re the winner! Long ago in the age of the Greeks, tales of the great beast called the Minotaur instilled fear in the hearts of men. Often, it was rumored, people were thrown into the Minotaur's maze for sport or punishment. If they survived they were hailed as heroes, and pardoned of their crimes If they failed, it was certain they would never be seen again. Maze of the Minotaur is a competitive explore and escape game. You begin the game in the center of the maze. Your goal is to find the exit of the maze in one of the four corners, and escape, before time runs out. The winner is the player who survived the maze, and escapes with the most victory points, before time runs out. Maze of the Minotaur features a modular tile board, unique player powers, and the ability to scale the level of competition in the game, making it an excellent choice for families and strategic gamers alike. Enter the Temple, but be cautious, for this is the home of Medusa. She is deadly, as her gaze will turn you to stone, and she never misses with her bow and poisoned arrows. Many have died trying to best her. Collect the Sword, Shield, & Mirror to confront Medusa, take her head, and rescue the fair Andromeda. Medusa’s Temple is a programming game created as a tool to illustrate the basics of pre-planned movement. Drawing four Move cards for the Heroes dictates the directions they my move or turn. Each Hero must use all four move cards on the turn. Medusa cards are numbered 0-7. Each turn one of these is drawn and Medusa moves about the temple, with her final facing dictated by arrows on the temple map. If she crosses over a Hero or ends facing one they are removed from the game. End the movement of a Hero with a sword next to Medusa, and the Heroes win! The monsters are out! In Monster Hunter you face the challenge of finding and catching the great monsters of history. Vampire, Dragon, Medusa, Yeti and 6 more frightening creatures await you. Travel through the unique terrain deck of Monster Hunter looking for the tools that are your only hope of capturing these creatures before you run out of time. Each Monster requires two specific tools to be caught. Easy enough? Watch out, don't get Scared, or you'll need that precious third tool to do the job. Find the Locations, arrange Transport, retrace your steps, or when all else fails, sick the Angry Mob on 'em! Monster Hunter is a solitaire card adventure! Inspired by the 40K universe and the Space Hulk mythos comes Phalanx. Ready yourselves, Brothers! The xenos threat awaits! Phalanx is a cooperative “dungeon crawl” style dice game for 1-4 players. Choose a team of four warriors to enter the ship and exterminate the enemy. Cleanse their hiding places, defeat the final threat, and reach the shuttle on the other side of the ship. Each warrior has a matching health track card, achievement tracker card, and custom set of 5 dice. Build the ship from the 4 level decks, choose the random finale card, and prepare for battle. Rolling the dice will generate points you will use to clear your quadrant of the encounter area. The battle can be brutal as you may receive damage not only from your facing quadrant, but from your flanks as well. So it’s important to work together with your fellow warriors. Each set of dice includes a special power die allowing you to assist players to your flank, re-roll your dice, double damage, heal another player, and more. Once a room is clear you’ll roll the salvage die which can provide you with extra damage, health increase, or a shield to block one attack. Clear a level and receive an experience die, adding more points to your dice pool, and you’ll need it. Each level of rooms gets progressively harder culminating in the climax of the story in the final room. The race for the red planet is on! The discovery of ancient ruins on Mars has fueled a race to claim hidden knowledge stored within. An intelligent race once populated the planet and we have identified several possible archaeological sites on the surface. A number of countries have made the arduous journey there to try and claim the prize. Base camps are set and they are searching for the sites. Manpower and technologies will need to be moved. Research of the fragile powering isotopes will be critical. Who will be first to find the key that unlocks aeons old potential held within the Ruins of Mars. Explore, expand, exploit, and exterminate! Seventh Sector is a smaller footprint 4x game. Using your space station as a home base, and refueling/repair area, branch out into the seven sectors of space. Populate the system with alien races. Are they friendly, will they trade, or could they be hostile? Discover planets and collect precious resources to upgrade you ship. Will you live and let live, or try and blast your competitors to space dust. It up to you to decide as you race for the Seventh Sector! Every Legend starts somewhere, why not with you! Tales of Legend is a campaign style dungeon crawl. Customize your character by choosing a Class and a Race. “Plug” them into you player board to calculate your stats and establish inventory volume. Select the combination of armor, weapons and equipment you’ll bring with you. You’re ready to begin your tale. With scaling difficulty level, unique story arcs game to game, and an easy combat and leveling system, Tales of Legend is nothing short of legendary! It’s the 14 century. Eurasia is facing the greatest pandemic yet experienced. No cure can heal it, no tactics can contain it, only the faith of a people remains. The black Death is a solitaire game of point management. Move your Physician, Knight, or Clergyman to the affected regions to manage the spread and effect on the populace. Draw from the Location deck to track where the disease erupts. Roll the die to track the spread. The Plague level is indicated by cubes on the board, the Faith is tracked by your efforts. Too much plague in a location, and the area is decimated, and counts as non-removable points for the Plague. Lose 10 locations and all is lost. Each season of the year offers a different modifier to help keep the plague at bay. If the Faith is higher than the amount of Plague at the end of the game, the populace will recover, and there is hope beyond the scourge! Risk the curse, break the seal, and journey into sacred burial chambers. How far will you go to loot the Tomb of the Pharaoh! Place the hallway cards, travel carefully. Descend the ladders to the lower chambers. How far must you go to reap the rewards buried here. Go cautiously, for there may lie a curse upon the tomb, a roll of the die may end your ambitions, and your life. The Wetworks card game is a competitive game of covert operations and assassination. Manage your hand of 7 cards. Collect matching card sets with stealth and secrecy. Choose you moment with care. Move the target out of the sights of your competitors and into your hands. Play your cards right and take out the targets for high rewards, or go for the ultimate score as the Double Agent! On a dark spire of rock stands The Keep. 10 stories high. Abandoned for centuries… until now. Wizards from the other side of the spire have begun dark deeds in The Keep, and they must be stopped. Enter The Keep, cleanse it of the invaders, and restore balance to the lands. Wizard Keep is a light magical skirmish game. Enter The Keep as one of the wizards sent to rout the enemy. Build The Keep from 10 of the tiles in the game. Each Keep becomes a unique combination of challenges. Use your Spellpower and Spellcount wheels to track the damage you inflict and the number of spells you have left. Fight your way through rooms filled with Acolytes, Apprentices, Sorcerers, and Warlocks. Use the power of the fallen enemies to recharge your stats. Each Warlock that falls gives you a bonus card. Enemies increase as you climb the tower, and some tiles provide them with offense or defense bonuses. Climb through the 10 floors, defeat the enemy, and win the game!